What happens when an an experimental social psychologist goes undercover? 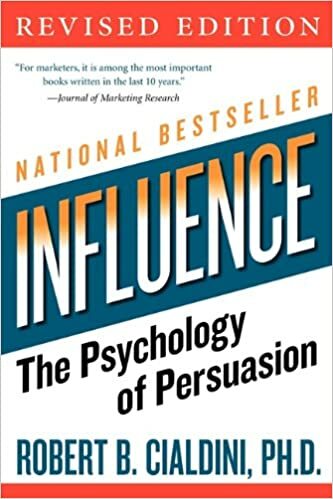 The book is based on a study by Robert Cialdini about compliance. The study involved participant observation, interviews with 'compliance practitioners', and their 'natural enemies' - the consumer agencies. It covers 'the factors that cause one person to say yes to another person and the techniques that most effectively use these factors to bring about such compliance'. He calls them the 'weapons of influence'. The book covers the six major weapons of influence in significant detail - and is replete with examples and real-life cases. Well, the answer to the question asked earlier is - you get 'among the most important books written for marketers' as the Journal of Marketing Research put it. The book is a must read for anyone in any position of influence - whether it is a marketeer, a business leader or even a mother at home trying to influence the little one. Warning: This book will forever change the way you look at offers, advertisements, product pricing, donation requests etc. Be prepared! Like us on Facebook https://www.facebook.com/ahluwaliams for more amazing stuff. Please visit Eclectic Readings for more book reviews!